Over the course of the past few years I’ve gone from a complete klutz in the kitchen to a meal maven. Looking back, it must have been a combination of a few things clicking in my head. First, there’s this little thing I like to call ‘ballin’ on a budget‘: as much as I love to live large, I almost desperately needed a way to keep my spending in check. Sushi, Dim Sum, Whole Paycheck Foods; you name it, I ate it on the regular so I had to put a stop to my delivery and dining out habits. Secondly, I was getting pretty sick of people ruining foods that I love. Third, I’m a firm believer that everyone should be adept at crafting their favorite comfort foods so I wanted to make a point of learning how to cook flavored, moist chicken and sear the perfect salmon. And last, but definitely not least: food, more specifically the gastrointestinal system, is the key to everyone’s heart. No, seriously! With the amount of serotonin receptors in your GI tract and stomach, it’s no wonder that food and mood go completely hand in hand. I started out slow and basic when I moved into my first apartment in 2008. 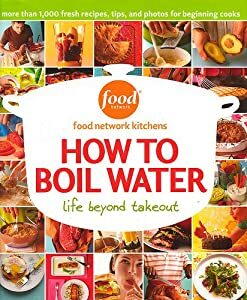 Right after I graduated from UCSB, my step-mother gifted me with a book ironically titled ‘How to Boil Water‘ that gracefully takes you through simple cooking preparation and elementary dishes to make you cool as a cucumber in your kitchen. That Christmas after demonstrating I figured out a thing or two about my culinary prowess, I got another gift – a year’s subscription to ‘Cooks Illustrated‘ and the famed ‘Good Housekeeping Cookbook‘. In the matter of five years, I’ve gone from being an expert microwave user to an amazing (and modest) chef! I’ve learned how to make homemade chicken noodle soup, salad dressing from scratch, craftmy own pizzas and toss up a mean stir-fry. Since I’m always up for a new challenge, I started scouring the interwebs for ways I could enhance my skill-set. I’ve been itching to have a ‘make-your-own-sushi‘ party or a fun, date night where my boyfriend and I craft our own ice cream – but when I found recipes to infuse my own olive oils I knew I’d hit the jackpot! I’m a sucker for a beautiful bottle of wine, beer or hard alcohol and this provides an adorable way to preserve and decorate the bottle for personal use or for your closest family and friends. wash all of your ingredients and dry them as much as you can; fun fact: botulism can’t grow in olive oil on its own, it’s actually caused by bacteria growing on the remaining water in your herbs! infused olive oils typically last for a month, give or take a few weeks (or, signs of spoiling). which is more of a reason to make it pretty, because if you don’t finish them they make beautiful table pieces. Last but not least, remember to enjoy your creation! Infused olive oils are a great way to quickly add flavor to a simple meal like scrambled eggs and for dipping breads pre-meal or as a snack. Also, if you’ve been gifted with a bottle of wine or liquor, this is the perfect way to return the favor – or, pay it forward.